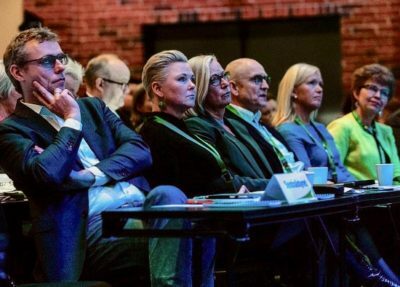 One deputy leader of the Center Party with a stake in the oil business wants Norway to pump up as much oil and gas as it can, while another is listening to calls for a more climate- and environment-friendly profile. As otherwise upbeat party members gathered for their annual national meeting this weekend, they’re split on what’s emerged as the most important political issue in the country. 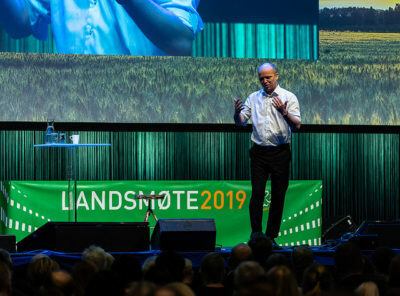 The Center Party is under fire over both its pro-oil policies and how its most important constituency, Norwegian farmers, are responsible for significant carbon emissions themselves. The party that boasts a green clover as its logo faces mounting criticism over its alleged failure to address climate change, even though its farmers suffered mightily under last year’s drought and received hundreds of millions of taxpayer assistance in compensation. “Unfortunately the Center Party has stood on the wrong side of the climate debate recently,” Silje Ask Lundberg, leader of Naturvernforbundet (Norway’s chapter of Friends of the Earth), told state broadcaster NRK this week. It’s a disappointment for the environmental group, which has been politically alligned with the parties in the left-center opposition in Parliament that includes Center. Now Center and, for example, the Socialist Left party (SV), are on a climate collision course. “You shouldn’t ridicule and criticize climate measures, instead of showing leadership yourself and showing how you can cut emissions,” Lundberg continued. She was referring to recent remarks by Center Party MP Geir Pollestad, who told newspaper Vårt Land last month that when he hears Climate and Environment Minister Ola Elvestuen speak, “I want to turn on the ignition and let the car just run.” Elvestuen, of the Liberal Party, also tries to protect Norway’s wolf population, which the Center Party want to greatly reduce. Center Party leader Trygve Slagsvold Vedum, who also has ridiculed the government’s climate policy, was gathering his troops in Hamar on Friday just as thousands of school children and students were striking to demand that Norway’s politicians do more for the climate. Vedum faced some strong disagreement over what the party’s climate policy should be. Deputy leader Ola Borten Moe, a former oil minister for the party in the last left-center government, led a commission that delivered a very pro-oil policy proposal, only to see it watered down by other Center Party officials who didn’t like how it rejected any attempt to halt oil production. Moe’s co-deputy leader, Anne Beathe Tvinnerheim, wants the party to create a greener image, and has even gone so far to admit in newspaper Nationen that some of party leader Vedum’s calls for lower petrol taxes and prices as “populistic.” One of the party’s other former leaders and oil ministers, Åslaug Haga, meanwhile, has actually called for a halt in Norwegian oil production on a specific date. Haga has seen the environmental light, according to climate activists, but her approach is widely viewed as too extreme. “They’re stuck in a dilemma,” Lundberg told NRK, with Vedum in charge of finding a way out of it. 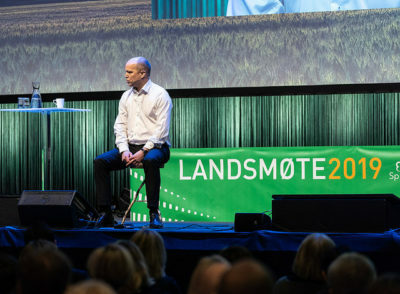 He had trouble clarifying the party’s climate policy during a challenging interview on NRK’s national radio program Politisk Kvarter on Friday morning but firmly denies he’s a populist, a charge others have levelled against him as well. He has said earlier, however, that he doesn’t want to change the party’s oil policy and stresses the need for stability. “Aslaug Haga (one of his predecessors) must be allowed to believe what she wants,” Vedum told newspaper Aftenposten earlier this week. “We have a party program.” The Center Party has voted against oil exploration off Lofoten, Vesterålen and Senja in Northern Norway and Vedum says the party’s goal is that oil ultimately will be unnecessary as a source of energy. He thinks it’s difficult, however, to set any date for ceasing oil production. In his opening remarks at the party’s annual meeting on Friday, Vedum rejected the labels Center has been slapped with in recent years, like “backwards, populistic” and “cynical.” He noted that the party has ended up with 190,000 more voters since the last local elections in 2015, boasting how it now holds around 12 percent of the vote, even edging out the Progress Party as Norway’s third-largest party in recent public opinion polls. Vedum is counting on record results in the upcoming municipal elections this fall, catering to a rural constituency that needs their cars and opposes fuel taxes, that relies on farming and raising livestock at a time when meat production is not considered climate friendly and fewer Norwegians are eating it, and who want to rid their areas of predators when many others want to save them. He nonetheless claims the party also will address climate issues.